In principle these systems are doing the same job as the use of a sump on a display tank to house some, most, or all of the required jobs of operation (heating, filtration, circulation), just expanded to serve more than one tank. The complexity of the plumbing is the primary difference from such tank-with-sump practice. â€œCentral systemsâ€ in current practice have central setups involving reservoirs or sumps from which processed water is distributed to each tank directly with metering valves to control the flow to each tank from the pressurized manifold (#1). That is comparable to the more familiar situation in which we use gang valves to distribute air from one pump to multiple air-operated devices, each with its own demand for flow, or in the same manner as a pressurized CO2 manifold feeding multiple tanks from a single pressure bottle. A central system functions essentially in the same manner for water. Each tank has over-the-side overflow or drilled bulkhead return(s) directly to a generally un-pressurized (gravity) return manifold draining to the central processing unit (#2). The return sump may use a separate pump to move water from the return sump to or through various devices, most often filters, or may use gravity flow to accomplish this. Individual tanks do not need to have their own biological or mechanical filters, but may have such if desired. Such systems commonly use constant-level siphons to maintain tank water levels if the tanks are not drilled for overflow. The central system technique is the newer of the two, as useful and practically priced valves and hobbyist-friendly piping were not readily available when the first multi-tank systems were developed. â€œCirculating rangesâ€ have similar central processing units, but processed water is fed to the first tank in a series, with flow-through to the next and subsequent tanks in the series throughout the range. This sequential flow contrasts with the basically parallel flow in central systems. IME, circulating ranges operate best with each tank in the series having at least minimal mechanical and biological filtration of its own. Unit flow through the individual tanks need not be as great and is generally lower than with most central systems, but may be comparable to such systems. My current circulating range involves two separate loops. Level changes in such systems again require constant-level siphons. Hard-plumbed connections between tanks are not the best choice here, as the rigidity of such couplings is a risk. Simple siphons are in the long run more controllable. The two major benefits of such setups are consistency of water parameters tank-to-tank, and ease of operation in water partials (which may be automated), and parameter testing. The major disadvantage is the absolute requirement for healthy stock throughout the system â€“ one communicably diseased fish added to the system, or one plant (or any other material) from a diseased setup could introduce problems via attached parasites or coating water which would be spread throughout the system. Rigorous quarantine is an absolute requirement. Another major disadvantage particularly for planted tank folk is that such setups are quite unfriendly to elevated dissolved CO2 levels as they generally involve open-to-the-atmosphere return plumbing which is well able to blow off elevated dissolved CO2 down to air-exchange levels (2-5 ppm CO2, #3). Many systems involve processed water returns to the tanks involving surface agitation to promote high oxygenation levels, and may also involve open-to-the-air filtration processes. All such systems need some redundancy for operational safety. Most often this involves duplicated returns as these are the most likely trouble spots due to clogging (#4), but duplicated feeds may also be used in the most cautiously constructed setups. If local water supplies do not provide the appropriate water type for the critters being kept, modifications are best done before adding water to the system. But that is no different from best practice for individual tanks. In-tank water modification is always a non-trivial risk to me. Also for me, handling of utility-added water treatments (#5) are also best done before the water is added to the system. The reduced requirement for biological filtration seen in single healthy planted tanks is unchanged in such systems, logically enough. The requirement for mechanical filtration is in no way reduced â€“ in circulating ranges it is, if anything, increased. That increase is needed to insure that the downstream tanks in a series do not become settling tanks for the prior tanks in the system, and thereby require extra vacuuming and other upkeep if not carefully mechanically filtered. Additionally, circulating ranges and some central systems lack sufficient flow to provide sufficient current in the individual tanks. As long as you are using power to move water anyway, you might as well get more bang for the buck by using filtration at the same time. As I separate mechanical and biological filtration as much as possible in all my tanks and use mechanical filters as current providers, this is easily done for me. Mechanical filters (entirely sponges for me) can be tap rinsed frequently (#6) with no special care. Even return of particular sponges to the same tank or filter is trivial â€“ cross-contamination is hardly an issue, everything in the system is exposed to everything else in any case. Such systems do not for me operate untended for extended periods, as individual fully self-contained tanks can do. Such systems absolutely need routine checks for circulation (both to all tanks and within each tank), water levels throughout the system, evaporation make-up (if not automated â€“ which subsystem would still require checking), temperature, etc. at least every other day and best daily. With such systems, floods are always more possible than with single-tank setups. That is the biggest factor and argument for redundancy in equipment and fittings. Individual tank care is much like that of any tank. Vacuuming is routine, and if done with any care does not cloud the system. Major tank overhauls are, if anything, easier than in single tanks as any temporary setback (#7) is readily compensated for by the rest of the system. The margin of biological safety is massive by comparison to a single tank. Stocking changes in any given tank are trivial (#8). Bioload is balanced throughout the system. Individual tank vacuuming, even a major overhaul, is done with care only that you do not take the central sump/overflow levels too low for normal operation. 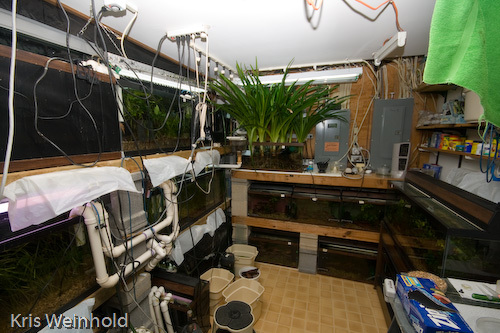 In central systems, individual tanks may be isolated from the system if desired for such work. In circulating ranges that is harder (but possible) and I usually do not do so, but in extreme cases (replacing a leaking tank) I do bridge between tanks. You just monitor the water levels in the tank in single tanks. In interconnected systems you work on one tank and watch the system sump. The most common risk is not allowing for sufficient drain-down margin in power-off situations (#9). Without sufficient drain-down area and volume, you have a guaranteed flood. Systems must be tested not just for function, but for malfunction as well. There are a couple of frequently used water partial techniques. While doing routine light vacuuming, I normally add make-up water relatively slowly by a lower-flow pump to the sump/overflow to compensate for the water I am removing. For faster partials without vacuuming in my circulating range, I shut down the circulation of the system, leaving the internal circulation (mechanical and biofiltration) of the individual tanks operating. I remove water from the system sump, adding new water by a higher-flow pump to the first tank in the system. As my maximum replaced water in one partial is about one-third of system total volume, not too much â€œnewâ€ water is lost due to the constant withdrawal/addition during the partial change. That technique is the more effective of the two for the water itself. In a single tank, that technique would not be as effective, there would be too much new water removed by constant mixing. Such systems as these are not new. My first awareness of such came from a Pet Library volume by Dr. Ferose N. Ghadially, the Advanced Aquarist Guide, 1969. Coupled with the circulating range concept was the idea of constant-level siphons, which are generally needed in such a system. By his references in that book, such practices were used back to the early 1950s. Being a lab person and a bit of a gadget nut, I had to try one. It worked beautifully. My now 37-year old son was a bit past toddler stage at the time I first saw the book. It incorporated veggie filters and a 24/7-lighted daphnia refugium both of which also have been used in my current setup. That same book first detailed Monaco-style tanks for me. We have better tools now, but still use them to accomplish the same ends. #1: These delivery pipes may recirculate as a loop, or may be dead-end. The former is preferred due to improved oxygenation and consistent mixing. Bleeding off water back into the source sump maintains line pressure but avoids the stagnation of a dead-end setup. #2: Please do not attempt to â€œbalanceâ€ pumps â€“ i.e., having one pumping water into a tank, and another pumping water out of the tank. It does not work. #3: The 2-5ppm data from George Booth is for well-aerated water without significant metabolic activity. Well-established tanks with livestock and non-trivial tank, filter, and substrate bacterial activity will show levels higher than clean-water equilibrium if not strongly aerated. Levels from air-equilibrium up to approximately 2x the air-equilibrium figure may be seen commonly, depending on the age of the setup and the surface agitation. Immature tanks (less than six months old) rarely carry the microbial load of older tanks. #4: Java Moss and Java Fern are two of the best clogging devices in my experience. #5: Such treatments include chlorine, chloramines, and short-life buffers. Air equilibrium by release of higher concentrations of dissolved gases is another positive benefit of local aging or tempering of water prior to system addition. #6: â€œFrequentlyâ€ is in the mind or judgment of the operator. I learned in my SW days that daily rinses of overflow prefilters made a huge difference in end pollution (nitrate, organics, whatever). I do not rinse FW prefilters and internal mechanical-only filters daily, but if I did so, I could reduce my water partials significantly. Weekly rinses are my aim, even if it is not always accomplished. Every ten days for the tank-internal mechanical filters is enough to keep the tanks and me happy. Some of the constant level siphons used in system circulation and a few of the simple siphons also involve sponge filtration as livestock barriers. For me, those require weekly rinsing at the minimum. When I operated the system at higher flow rates, duplicate filers were required, along with twice weekly rinsing. #7: Such a â€œsetbacksâ€ could be a major pruning with vacuuming and replanting. Or a major change in stocking levels could be another. #8: Bioload is based on the entire system, not on the individual tank. In a stand-alone 15-gallon tank you would hesitate to a new dozen neon tetras to an existing dozen â€“ the biofilters could need some catch-up time. In a central system or circulating range, the bioload is based on the total system volume, and that is likely to be some multiple of any given tank volume. You would not hesitate to double the stock of one small schooling fish group among many fish in a 300-gallon tank would you? #9: My current system has 19.5 square feet of surface in the main loop, plus 6 in the secondary loop, for a total of 25.5 square feet of nominal surface. The filter and sump is 5.5 square feet nominal. Obviously in power-off situations, the higher drain-down levels than under positive flow will be magnified in the reduced-area filter and sump. In my setup, that translates into an increase in the level of the sump-filter combo four and a half times the drop in the tank levels between operational and power-down. If your sump cannot hold that much, you get a nice thin layer of water on the floor. #10: The unfiltered outflow from the daphnia tank fed into the sump, which was stocked with Singapore shrimp. Those were the best filter-feeding shrimp I have kept. They bred regularly, but were not reared due to the hatchlingâ€™s need for brackish to marine conditions.